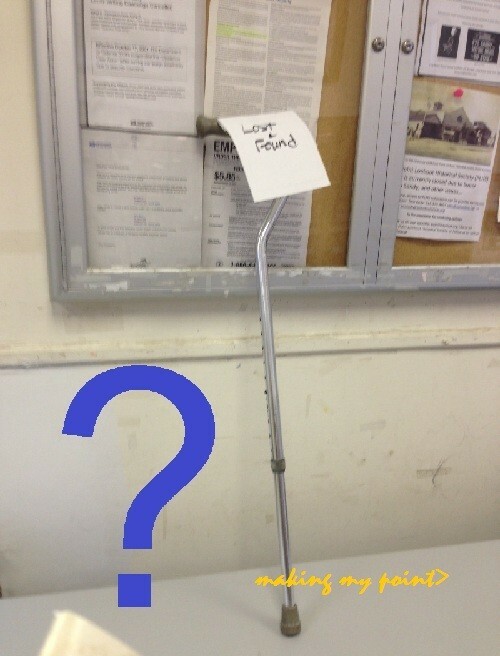 Lost and Found: Of course it looks like a ? I saw this again yesterday in the Point Lookout post office. Its been there for over a week. I didnt really think much about it at first, but every time I’ve gone back, the passage of time has lent an air of mystery. every day it sits there brings a new question. Its been moved, had a sign put on, sign taken off, new location , sign back on, sign folded back, sign folded forward(to get this picture), now no sign again. Dang thing is just a big giant “?” …in every possible way. how the heck did they get home? doesn’t somebody know who this belongs to? how are they living without it? they haven’t come back to get mail in this amount of time? what exciting delivery would make them put it down and forget (they needed) it? I wonder if they (whomever they are) are overdue for someone to check up on them? what does it make you think about? please add your questions (and by all means any answers!) in the comments below. Always a fun and rewarding day. Get your hands dirty and make something, together! Heads up – the date has been confirmed now. 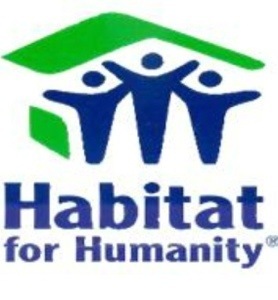 We will be working on a project in the Westchester area. Eric@ThePLCC.com if you are interested in coming along. Our assignment will depend on the size of our group, so please let us know as soon as possible. 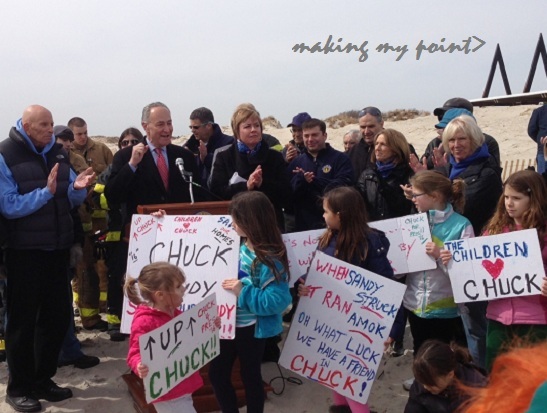 Sunday March 24, 2013, Point Lookout Civic Beach- Dozens of politicians and civic leaders descended on Civic Beach to rally around the coming together of the 4 towns in the now fully funded Long Beach Barrier Island Storm Damage Reduction Project, in front of dozens of residents of Point Lookout, Lido Beach, Long Beach and Atlantic Beach. “Today the dream of being safe from storm damage is much closer to reality, and that’s something we can all cheer”, said Town of Hempstead Supervisor Kate Murray. “We are united as a barrier island”. 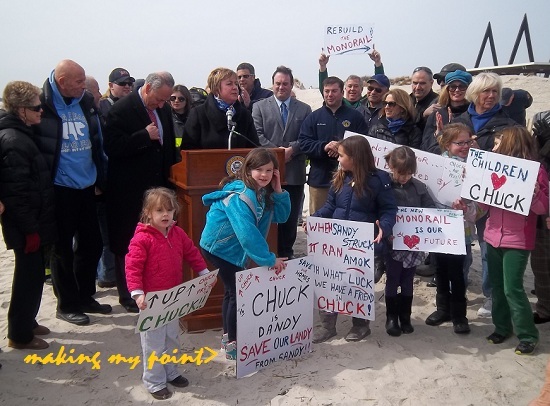 Kate Murray, flanked by Point Lookout Ambassadors (l-r) Megan Cox, Erin Brown, Sarah Magan (in navy) Lauren Cox (in charcoal Gray) Stella Curtin (rear in white coat) and Johanna Dullahan (in hot pink coat). Well Done- Thank You Ladies! 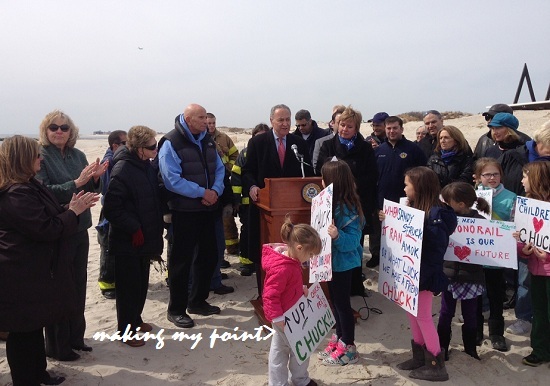 Senator Chuck Schumer spoke: “After a decade of planning, multiple storms and destruction, we have finally secured $150 million to give Long Beach the protection it needs”. The senator said that there’s three steps to be done now. The first is the engineering and design study, which must be coordinated with the building of the Long Beach Boardwalk. This could take 3 to 4 months. Then that has to go out to bid to hire the contractors. This will take several months as well, and they want to start as soon as the study is done. Then to start the work, which will take months as well. 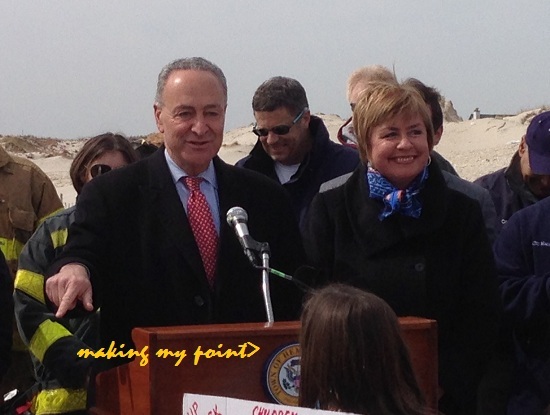 “We want it shovel ready, in the ground by 2014. That means they’ll start working on it… and get much of it done by next summer season” (summer of -2014). all around the picture are representatives from Nassau County, NY State and most of the Long Beach City Council and City Manager. “Get moving. You got the money, got the authorization, get the plans … and we don’t want any bureaucrats’ delay”. 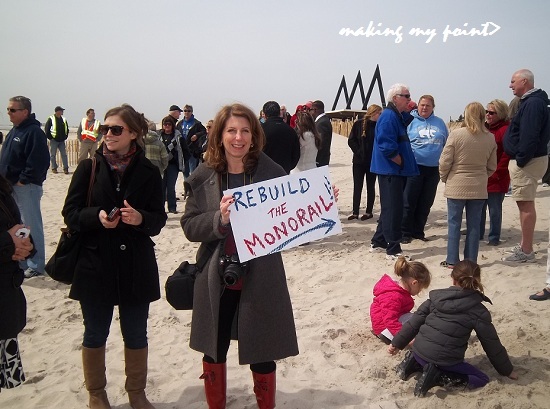 Our project is part and parcel of a complete coastal project now to be taken underway all the way from Staten Island, to the Rockaways, Our Long Beach Barrier Island, and then the FIMP-Fire Island to Montauk Point. Harvey Weisenberg thanked our hero from Washington. “We waited 20 years. The (current) City Council had the courage to move ahead, and now we are going to have the progress we deserve” Harvey Weisenberg said of Long Beach voting unanimously to move forward on this plan. 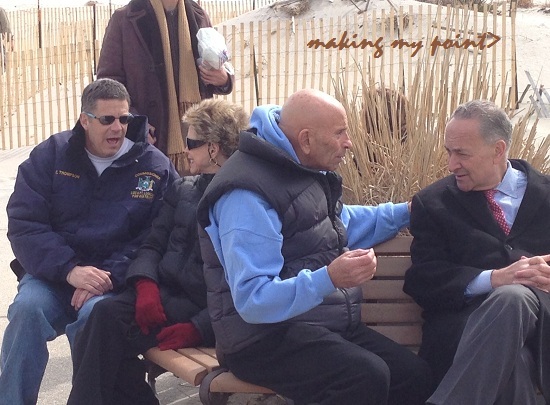 Long Beach City Council President Scott Mandel Thanks Chuck Schumer for his help. 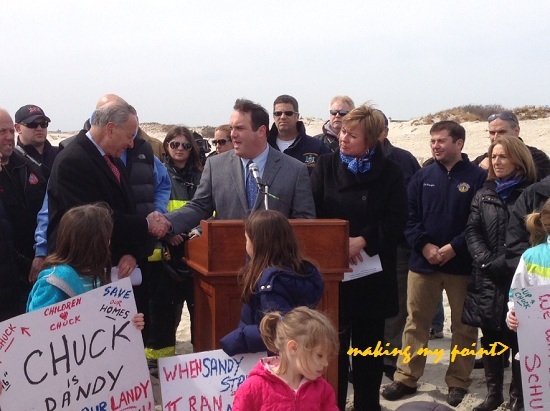 Long Beach is On Board for the Long Beach Barrier Island Storm Damage Reduction Project. 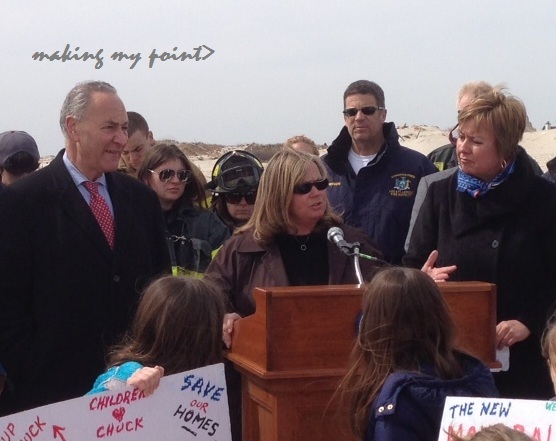 Lido Dunes Civic Association President Liz Murdy speaks. 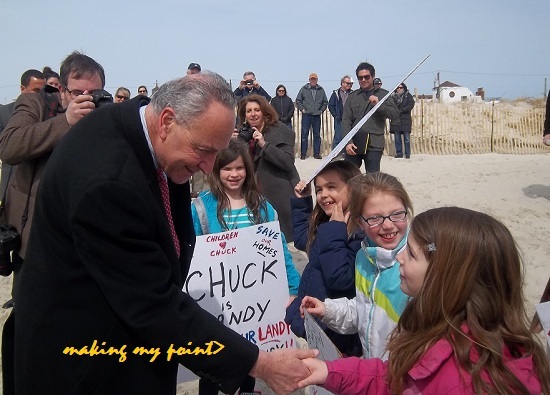 Liz Murdy from Lido Dunes Civic Association had praise for the Senator. “Without his perseverance we would not have gotten the funding and we really appreciate it”. 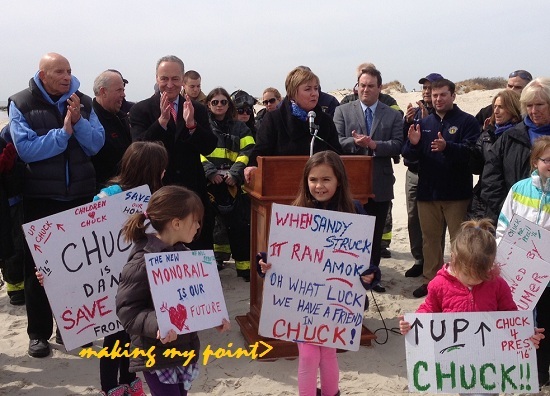 She also thanked Town of Hempstead Supervisor Kate Murray and Department of Conservation and Waterways Commissioner Ron Masters for the work he and his department have done all these years, protecting and strengthening our beaches and our dunes, virtually without any outside help. 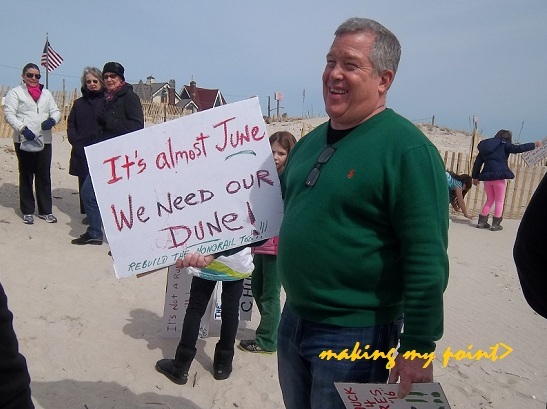 Paul Curtin makes HIS point, and hopefully we’ll all have dunes by summer 2014! “It will be strong; it will be tested; it will be Sandy-proof. 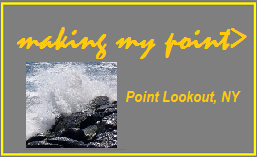 If anyone is having doubts whether they should invest in their small business or in a home here on the Long Beach barrier island they should go forward. just a little gag about all the hub bub surrounding the filming for the Pilot of a new NBC series, The Blacklist, which commenced this weekend at the Long Beach NY bridge. thanks to “action movie” for the FX! 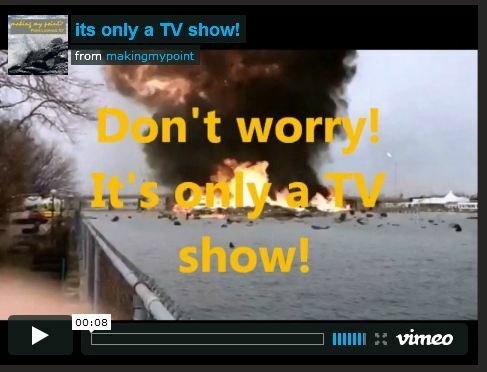 its only a tv show! click on this video to check it out! 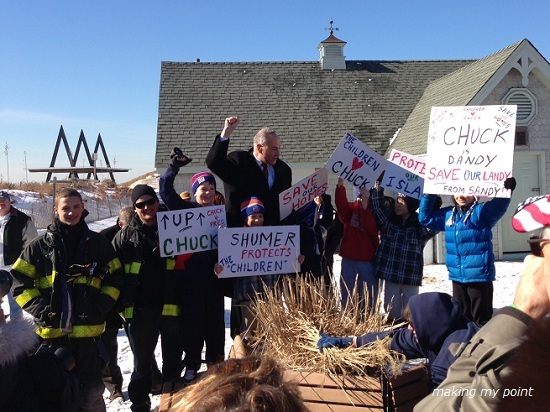 Senator Schumer, who visited Point Lookout back in January, will return this Sunday to update us on progress toward Sandy recovery for our area. Lets have a great turnout, he’s expected Sunday at 1. ill post further details as i get them ! 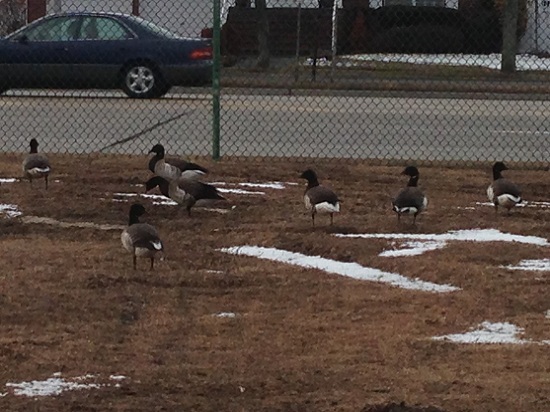 Brant Geese… where the heck did they come from? 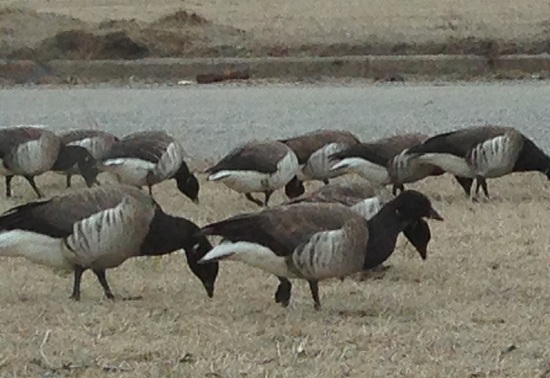 Maybe it’s just me not noticing them in years past, but this year we seem to have a huge flock of what someone told me are Brant geese in the area. 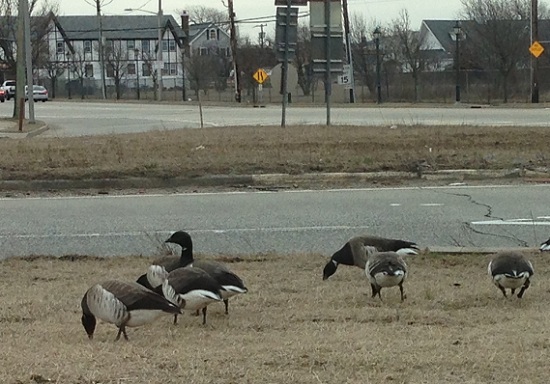 They’re different from the Canadian geese I’m so used to seeing. They have a shorter, fatter neck. They’re stockier, yet smaller than the Canada version. The reason I’ve noticed them is I cannot believe the numbers of them getting hit by cars on Lido Blvd outside town, and on the Loop Pkwy. It’s more than just a few that I’ve seen these past few weeks, at least 10, probably more. There were 2 more dead just on the Loop Parkway yesterday. This is just a slaughter. 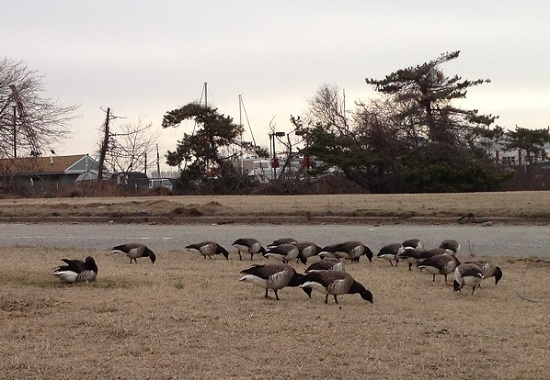 Ive seen a large number grazing the plazas on Park Ave in the east end of Long Beach… where theres been some hit as well. 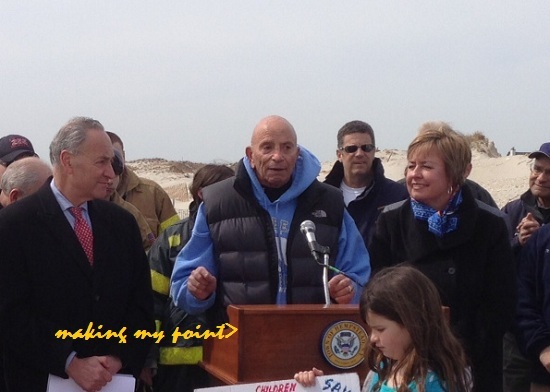 I was wondering if they’re displaced by or disoriented from Sandy somehow. They do seem to have taken over the west side of the Loop Parkway from the drawbridge on, where the regular Canada geese used to be and especially at the Loop Parkway entrance. They just seem oblivious to danger from cars and seem to congregate close to the road (though they flew off when I got out and tried to get these pictures). I couldn’t get close enough to get the pictures I wanted without being near or in traffic on Lido Blvd, which is exactly the problem! Like the Canadian geese crossing the road in a line, I’ve seen them doing this solo and in small numbers. Are they displaced or have I just not noticed them before? Maybe we can keep an eye out to avoid hitting them on the road if they’re just further Sandy victims, just passing through?